In Dan Dare - Pilot of the Future, the Biography Daniel Tatarsky celebrates, with a shrewd critical judgement, the achievement of Frank Hampson and his team, while at the same time placing the stories in the context of the 1950s. In so doing he presents a lot of history that I hadn't realized even though I lived through those years. For example he points out that bread was only rationed after the Second World War, and that the premise of the whole story - the quest for an alternative food supply for Earth - was extremely relevant in the days of shortages and rationing. 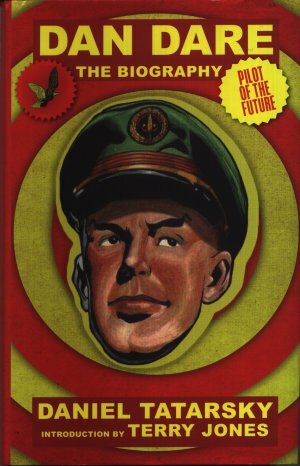 At the same time he makes many surprising behind-the-scenes revelations: such as that, in the original dummy of the Eagle, Dan Dare was actually a Space Fleet Chaplain, complete with black shirt and dog collar - echoing the Eagle's founder and editor, Marcus Morris, who had of course been an RAF chaplain during the Second World War. Dimensions : 14.5cm x 22.25cm with 238 pages. Colour images of many of the original dummy issues. See a Dan Dare Radio Station in its original box. Learn how the comics were put together. Of course, the Mekon is there too !